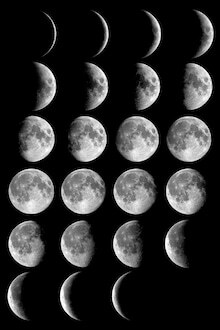 A lunation is the cycle of the moon's phases, beginning at the new moon and moving through the first quarter to full moon, and then through third quarter to return to new. Lunations have been numbered since an arbitrary starting point in 1923, and this work was composed during the 1113rd lunation (December 2012 - January 2013). The first movement, New Moon, opens mysteriously and sparsely, with sporadic percussion gestures suggesting the very dark and star-filled night sky that accompanies the beginning of the lunar cycle. The second movement, First Quarter, is rhythmically charged and builds in energy from beginning to end as the moon grows brighter. The third movement returns to the materials from the opening movement, but now they are bathed in a continuous bright glow from the full moon. This leads without pause into the final movement, Third Quarter, that returns to the rhythmically energized character of the second movement. As the light from the moon dwindles, so does the energy of the music, eventually fading away into silence. This work was composed for bassoonist Scott Bartlett at the University of Michigan. Watch a video of the bass clarinet version, played by F-PLUS: Andy Hudson, bass clarinet, Kate Dreyfuss, violin, and Josh Graham, percussion. You may purchase sets of parts or individual scores with the buttons below, and note which version you would like to buy - with bassoon or with bass clarinet. Each set of parts comes with a score. If you need a quote for a purchase order or would like to purchase pdfs of this piece for a discount, please contact me.